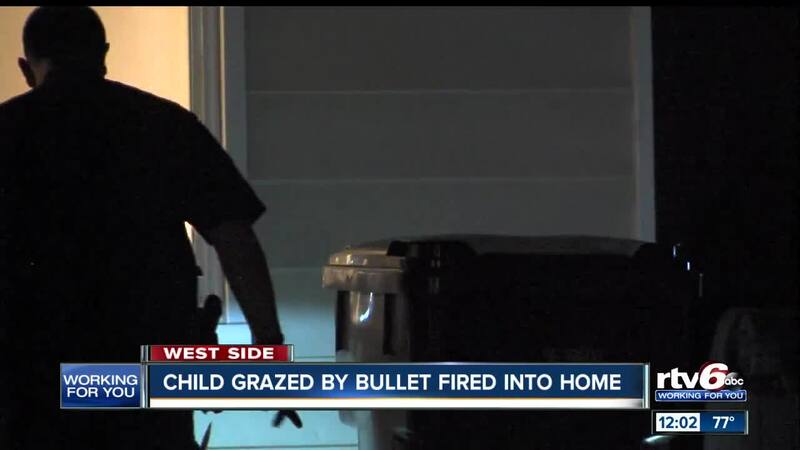 INDIANAPOLIS -- A child was grazed by a bullet late Monday night after somebody fired shots into the house where he was staying. The shooting happened at about 11 p.m., in the 5700 block of Alpine Avenue. The 11-year-old boy was at the house with other children, celebrating the 74th birthday of Raul Perez. "The doors were secure," Perez said. "We felt safe inside." Perez said he heard something that he thought was firecrackers, but it turned out to be gunfire. The bullet went through a window and grazed the boy on his upper torso, police said. He was taken to Riley Hospital in an unknown condition. It is a safe neighborhood, Perez said. "We've felt safe here for three years," Perez said. "We've never had incidents this close to the house." Perez said he doesn't know what to say to the boy's parents after the shooting. "Their parents must think we have bandits in here or something," Perez said. "I really don't know what to make of it. I'm confused and I'm scared." Watch the full interview with Perez below. The shooting is the third instance this year of an Indianapolis child shot while inside their house. In March, 1-year-old Malaysia Robson was killed when somebody fired into a house in the 3500 block of Wittfield Street. On Thursday, a 4-year-old was hit in the foot while watching TV in her house.